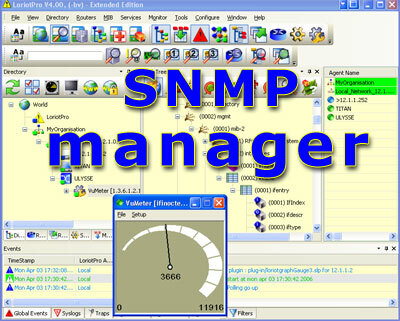 The snmp manager is the cornerstone of any management infrastructure. Management consists of keeping networks and systems running, maintaining performance, controlling and managing usage. The snmp manager provides the interface between the human network administrator and the managed network system or infrastructure. The snmp architecture consists of a snmp manager, a snmp agent, a database of management information (MIB), managed objects and the Simple Network Management Protocol network protocol itself. The snmp agent is a piece of software located in the managed device and provides the interface between the snmp manager and the physical devices or software applications being managed. The MIB database serves as a local data repository in the snmp manager that is used to assemble and interpret the variables sent in SNMP messages. The LoriotPro software is a snmp manager component of the manager/agent model defined in the Internet standard RFC1157. LoriotPro as a snmp manager covers the following domains, mib objects management, snmp request construction, snmp response collection and treatment, data processing and displaying. The snmp manager main role is to poll end stations or devices and their snmp agents to check the values of certain variables defined in the MIB. Polling can be automatic or user-initiated, but snmp agents in the managed devices respond to all polls. The managed devices, such as computer systems and other network devices, with its snmp agent enables them to send alerts called snmp trap when they recognize problems for example, when one or more user-determined thresholds are exceeded. Upon receiving these alerts, the snmp manager can be set to react by executing one or several actions, including administrator notification, event logging, system shutdown etc. LoriotPro uses other Internet protocol than snmp to perform its main task, the monitoring of networks and systems. mib database with search option, mib duplicate name protection, mib object linear and gauge graph, mib object trend graph, snmp requester, snmp protocol analyzer. Read the LoriotPro documentation and the snmp protocol chapter that explains in more detail the snmp manager roles, snmp agent roles and the mib structure.